Hemp oil is created by pressing the seeds of cannabis plants and can be used as a nutritional supplement in foods or on the skin to reduce inflammation, boost the immune system, and more. Because of these skin-strengthening properties, hemp oil allows the body to better resist infection and has been shown to be an effective treatment for eczema, dermatitis, psoriasis, and acne. Homemade skin-care products are a wonderful way to create a product tailored to your specific needs. 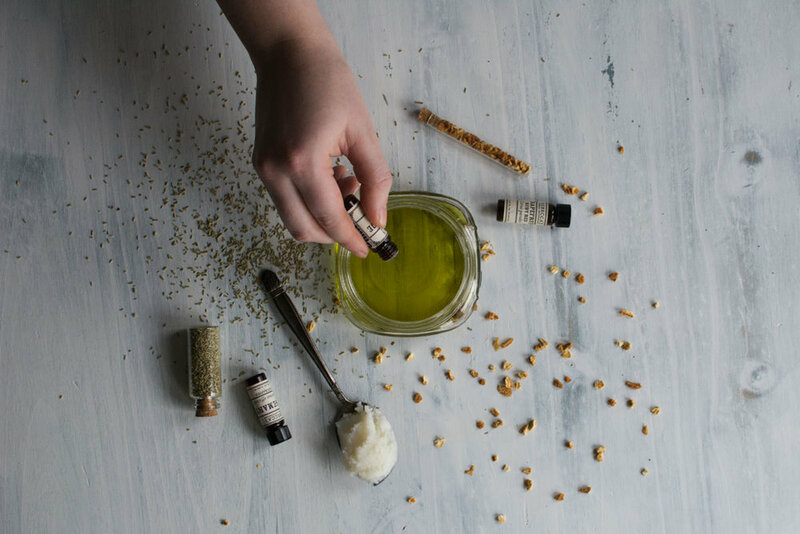 We're big fans of body butters, so we decided to adapt this Rosemary Citrus Body Balm recipe by Home Song blog to include our favorite plant, cannabis. To infuse your coconut oil: Add 1/2 c coconut oil to LEVO basin & fill pod with lavender & rosemary. Infuse at 200°F for 30 min. Remove pod; note that it will be hot! To make your body butter: Add shea butter, beeswax pellets, and hemp oil then set at 150°F for 15 min. Melt coconut oil, shea butter, hemp oil, and beeswax pellets in a double boiler then pour the liquid into glass jars. Add essential oils and stir until desired aroma is achieved. We started with 5 drops of each essential oil, then increased from there. It's important to use a glass jar because this liquid will be hot and could melt plastic. We made a small sample infused with CBD — check out details below! If you'd like to enhance this recipe with cannabinoids, consider using one of the products below. We recommend using between 5-30mg of CBD per serving, depending on your needs and body weight (typically 1-5mg of CBD per 10 lbs of body weight). Remember to always start low and go slow when it comes to cannabinoids, and be sure to read our CBD Safety article and talk to your doctor before incorporating something new into your routine. This tincture is a whole plant extraction made with hemp grown in Colorado and carried in fractionated coconut or MCT oil. It is a lipid infusion, meaning that it uses no solvents in the extraction process and retains a full range of phytonutrients, including all of the plant’s cannabinoids and terpenes. A full dropper of their 450mg bottle contains 30mg of CBD, and the dropper has measurements on the side for easy dosing. If you're in a legal state or have access to hemp, you can also add available cannabis flower to your LEVO herb pod to infuse the butter in this recipe. To infuse cannabis flower with butter, set your LEVO to 165˚F for 2.5 hours. Learn more about the LEVO Oil Infusion Machine here! The product shown here was gifted to Hempsley by Levo and Papa & Barkley during their Heart of Health Exchange sponsorship. All opinions are our own. Thanks for supporting the brands that support Hempsley! *These statements have not been evaluated by the Food and Drug Administration. The efficacy of these products have not been confirmed by FDA-approved research. These products are not intended to diagnose, treat, cure or prevent any disease. All information presented here is not meant as a substitute for or alternative to information from health care practitioners. Please consult your health care professional about potential interactions or other possible complications before using any product. The Federal Food, Drug and Cosmetic Act requires this notice. The product shown here was gifted to Hempsley by Levo and Papa & Barkley during their partnership for our Heart of Health Exchange. Levo and Papa & Barkley’s sponsorship supported our mission to bring you free, quality education by allowing us to purchase props, create original imagery, perform research, write and edit content, & host events in our local community. Although this is a sponsored recipe, we assure you that we are committed to bringing you unbiased information and promise that all thoughts and opinions are our own. Thank you for your support!